The discovery presented in the books listed below, will reunite science and religion by solving the mystery of human existence. To fully understand the discovery, we recommend that you read the books in the order of publication. They will forever change the way we view ourselves, science, religion, and the gods of the ancient world. To receive the Ideology Free Zone Newsletter: Subscribe. History affirms that supernatural beings ruled the earth in the ancient world. These powerful gods used immeasurable wealth and sophisticated intelligence to place advanced civilizations on every continent of the globe. The sudden collapse of that world plunged the earth into the deep ignorance of the dark ages. The ominous fall of the gods and collapse of the ancient world is planet Earth’s greatest unsolved mystery. 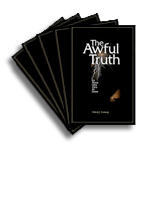 The solution, as revealed in The Awful Truth will forever change the way we view ourselves, science, religion and the gods of the ancient world - both biblical and pagan. Autographed early editions may become a valuable collectable! Please click here to view Covers & Overview, to read an excerpt Free Offers, and read Reviews. Price: 19.95 Autographed by author. Share this world-changing discovery with family and friends. Autographed early editions may become a valuable collectable! Struggling with gift ideas for special occasions? There is no better gift than the truth. Five books autographed by Mr. Conway at just under $10.00 each, will supply a great gift for five loved ones on holidays and special occasions. 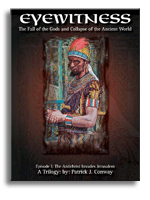 The Fall of Jerusalem: chronicles the last days of ancient Israel, as a three-sided civil war ravaged the Jews with famine, pestilence, and fire. 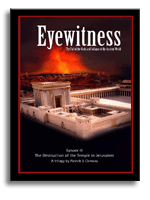 Precisely as foretold, the temple was destroyed to the foundation stones and the city was left utterly desolate; thus, ending the Kingdom of Judah, and the tribe of people known as the Jews. Civil War Engulfs the Jews, The Last Prophet of God: Josephus was a high priest, historian, and prophet. God instructed him to foretell the rise of Vespasian as Emperor of Rome, and the fall of Jerusalem. He recorded that a rebellion in Jerusalem became a civil war among the Jews, and culminated in the destruction of the temple and Jerusalem. In his Antiquities of the Jews, the Prophet declared that Jesus was the Messiah! Please click here to view Covers & Overview, to read an excerpt Free Offers, and read Reviews.. Tentative Pub. Oct - Nov 2019. 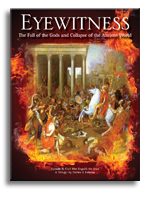 The Antichrists Invade Jerusalem: documents the fascinating account of the coming of the Antichrists. They invade Jerusalem, and take control of the government. Tentative Pub. Oct - Nov 2020. 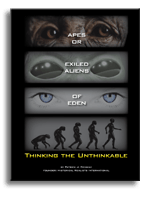 What Science and Religion Do not Want You to Know: documents the last days of our ancestors in Eden, and their early days as mortal beings, exiled on the Earth. Tentative Pub. Oct - Nov 2021. 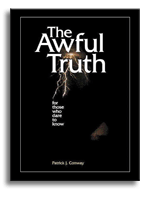 The Awful Truth by Patrick J. Conway is now available as an eBook.